In the present days that we have now, there are tons of different variety of toys that our kids can choose from. There are toys that can be used in different ways depends on the child’s imagination and creativity. Some of them are also made to boost the passion of a child to a certain thing like role-playing toys or tower blocks. Kids always love toys every day of the year, that is why each year there are new toys that are created for our children to play with. Some toys today can now move automatically with just using a remote control. Here are some kids riding motorcycle toys that your kids may want and enjoy. Quality: since this will be used by your kids, the materials that are used to create and assemble it should be safe and has a high-quality rating. Make sure that the materials are safe and do not contain any dangerous substance that may affect the health of your kids. Durable: the product that you must buy should be tough enough to be played by your kids and can undergo any circumstances without breaking easily. You kids may use it roughly so make sure to check the durability of the kid’s motorcycle that you are going to buy. Price: the price may differ on the brand or the size of the motorcycle that you want to buy for your kids. There are high quality and safe electric kids motorcycle rides that may cost a little than other branded products. Battery lifespan: the battery of it will be the heart of the entire toy. Make sure that it is made from great material and can last for a long time. Do not forget to check the battery life of the toy for your kids to enjoy the ride longer. The Razor has been focused to give the children in our generation the best riding experience at a young age. Using a top of the shelve cutting edge technology to provide high-quality toys that kids will surely enjoy. The award-winning Razor offers the Dirt Rocket MX350 that is scaled down and it is powered by an electric battery. Inspired by dirt bike sports, the Dirt Rocket MX350 will give your children a realistic feeling of riding a dirt bike. The Razor Dirt Rocket MX350 is one of the best miniatures of the dirt bike that is in the market. This promises your kids to experience the realistic feeling of riding a dirt bike even on really rough roads. It has a single speed and can run up to 12 miles per hour. Razor offers this Pocket Mod Miniature Euro Electric Scooter that gives your kids the girly passion that they want. It is a vintage classic Italian style that is very easy to use and gives high performance. This is very eye catchy for that little princess who wants to have their bike on their own. The Pocket Mod Miniature Euro Electric Scooter is inspired by Euro-style. It comes with different fashionable colors and has a compartment like the real scooter. Some verified buyers said that it can have battery issues. This is suitable for your princess that wants to ride a bike that is in her style. This may be a kids toy but it has a high-performance motor and can reach up to 10 miles per hour on a single charge of it. It has a pneumatic tire that allows its rider to have a smooth and steady ride. Uenjoy Kids Motorcycle Power Wheels Motorcycle guarantees that kids will learn how to use it within 5 minutes. It comes in 4 different colors that will surely like by your kids. The charging time off is 8 – 12 hours. It has two auxiliary wheels to provide safety and steady features of this kids motorcycle. This has the smooth and great suspension that makes it easy to ride by your kids. 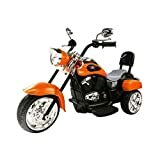 This Uenjoy Kids Motorcycle Power Wheels Motorcycle has a charging time of 8 – 12 hours and can run for 1- 2.5 hours. This has an automatically intelligent charging system. This is best for your young boys that you want to learn how to ride a bike. 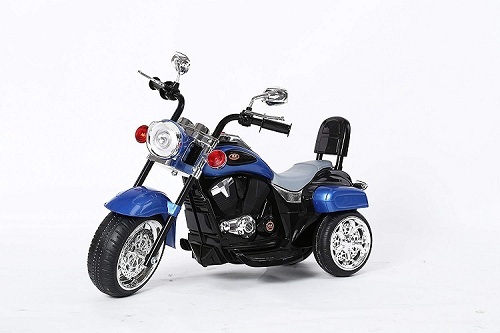 The Chopper Style Electric Ride On is the best ride for your toddler. This has two speeds that can be easily mastered by your toddler. Kids will feel the realistic experience of riding a motorcycle. It uses a foot pedal to control the motorcycle, this is used to move forward or backward. It can also easily assemble and it will be ready to be used within 20 minutes. This is the best motorcycle for your toddler that wants to experience the feeling of riding their own motorcycle. It also has lights and sounds that will give additional realistic feeling to the toy. Street Racer New Ducati Motorcycles is very suitable for your kids that is 3 – 6 years old. It has a very comfortable leather seat and has a realistic shock absorbent. Also has an audio input to give extra entertainment to your kids. The Street Racer New Ducati Motorcycles is known as a great miniature of a motorcycle for ricing. And the lights that are attached in it has the same function as the real motorcycle. Has a smooth start and the motors on it is quite. The electric system of it gives gradual acceleration. The breaks in it are also reliable. The seats in it are comfortable and made of leather. It has an easy maintenance system and the soft EVA foam rubber tires with the dual training wheels that make the motor steady even for the kids who just started to ride a bike. The 2019 Street Racer 12V Electric Kids Ride has a spring shock absorbent that gives a comfortable ride to your kids while using the motor. The 2019 Street Racer 12V Electric Kids Ride only uses 2 speeds that make it safe for your toddlers to use. It has an electric brake system and a soft and smooth start. The pull to start of the V-Fire 4-Stroke 40CC Kids Gas Pocket Bike gives realistic experience to your kids. The 4 stroke engine is great and easy to operate, this will surely love by your young boys. This will surely bring your kids to go and enjoy the outdoor adventure with the V-Fire 4-Stroke 40CC Kids Gas Pocket Bike. It is operated by gas that makes it really interesting and exciting. The motor is 40 cc with 4 stroke that is EPA registered. The chain drive system of it is powered by gas that makes it a great miniature of a real motorcycle. It is also safe and has a very stylish look. The MIGOTOYS Trike Motorcycle Powered Wheel Ride will bring the real feelings of riding a motorcycle to your kids. It has a build in sounds and lights that gives extra realistic feeling to your kids. It is best for your kids that want to experience riding a motorcycle of their own. This is great and has a very realistic design that makes your kids more interested in it. The MIGOTOYS Trike Motorcycle Powered Wheel Ride gives the kids the real driving experience that your kids may love. It has built-in sounds and lights that bring the experience of riding to the next level. If you are looking for the right motorcycle for your kids this may be the one that you are looking for. It has a very sleek and smooth design that can roll to a different surface. It has a two-way knob to give extra safety to the user of the motorcycle. 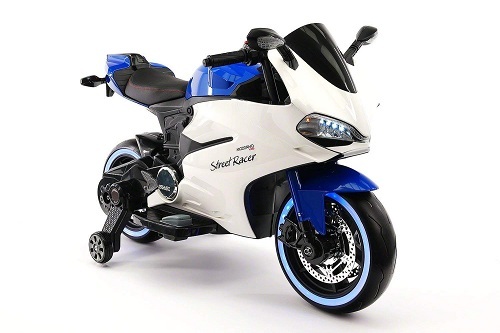 It uses 12 volts rechargeable battery that can give power to the motorcycle to 2 hours. This comes in red and pink color for your girls and boys to enjoy riding their bike together. The Peg Perego Polaris Outlaw Ride-on Vehicle has a very sleek, strong and sporty design that will surely love by your kids. It comes in two colors namely red and the pink ones that will perfectly suite for your princess or prince. The Polaris Outlaw gives this new motorcycle the real feeling of riding a motorcycle. The Rosso Motors Kids ATV Kids Quad 4 Wheeler created one of the greatest electric motorcycles to give the high-quality experience to your kids. It features a very strong battery that has a long life and it is very powerful. The Rosso Motors Kids ATV Kids Quad 4 Wheeler uses 36 volts of lead-acid battery that gives 500 watts power to the motorcycle. It has a 3 gear transmission and has a reverse function to give a very realistic control of the motorcycle. The tiers of it are inflatable and have a 10” in diameter. Kids at all ages can demand for a new toy every second of the day. Your kids may want to start to ride a motorcycle, may be influenced by the things that he or she watches on the internet or television or maybe by the people around them. Truth be told that riding a motorcycle can be really dangerous even for the adults. But there are different toys now that enables your kids to enjoy riding a motorcycle that is safe and easy. There are different kids motorcycles now that are out of the market for the kids to enjoy riding a motorcycle. But before buying on for your kids you should know about the things that you should first check and know for your kids to enjoy the toy beyond limits. The height of the motorcycle – if you want you kids to enjoy riding a bike, make sure that you will first look at the height of the motorcycle. Ensure the size of it will fit the height of your kids. This will also add safeness for the kid while he or she is riding the motorcycle. It can be really dangerous if the height is not matched to his or her size. Make sure that when your kid is sitting on the seat, their feet will touch the ground properly and that they can balance the bike by themselves. The power source of the motorcycle – there is a different power supply that a kids motorcycle can use. There are some that are powered by rechargeable batteries and some can be powered by gasoline. The battery-powered kid’s motorcycle usually has a running time of 2 hours and recommended to be charged for 8 – 12 hours before using. 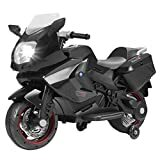 While the kid’s motorcycle that is powered by a gasoline depends on its running time to the gasoline that its user can provide, this type of motorcycle uses a chain drive system. The transmission – some kids motorcycle only has two transmissions, it can be slow or fast. Some have 3 gears transmission from slow, medium speed and fast speed. And the upgraded kid’s motorcycle now has a 4 transmission and comes with a reverse function. The transmission of the motorcycle is the one that handles the speed of the motorcycle. This will also a basic safety function of a motorcycle for kids. Wheel size – the wheel size also plays a vital role in a motorcycle even if it is for kids or for adults. For the kid’s motorcycle, the wheel size should have a great suspension and has a smooth rolling function. Wheels should also be checked before letting your kids to ride their motorcycle. Maintenance of the motorcycle – even though it is just a small kids ride, a motorcycle is still a motorcycle. Kids motorcycle also has a required maintenance. There are parts that can be lost after being used sometimes or the wheels can be not as good as it should be. Make sure to pick a kids motorcycle that does not need heavy maintenance requirements for your kids to enjoy the riding experience and for you to dodge the hassle of checking the motorcycle every other time. Buying a motorcycle for your kids is one of the best ways for your kids to drop their tablets or cellphones and to enjoy the nature and the outside world. Admit it, there are times that kids at this present time do not know how to play with other kids outside the world of internet. Kids motorcycle is a great way to encourage your kids to engage with outdoor activities that they will surely like. Aside from the perks of your kids playing outdoors, this can also help to develop their skills, coordination, and discipline. There are tons of different varieties of kids motorcycle that you can buy in the market. They can come in different colors and style that can boost the interest of your kids to play with it and to enjoy their playtime outside. Just make sure to check the things you should remember before buying this type of toy for your kids. Because this might just look like a toy but your kids still need supervision while playing with it.